FCE Course Lesson 3 – Another dialogue taken from a recent exam of the b2 first. A dialogue of the b2 first speaking skills section. In this lesson we talked about the importance of listening and the need to get used to the different accents in the Cambridge exam first certificate. The listening lasts 40 minutes, equates to 20% of the overall score and consists of 4 parts and 30 questions. 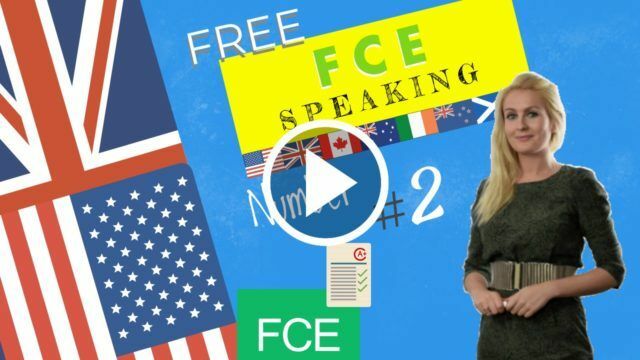 Gordon is a teacher of FCE english he thinks that one of the most important things to get used to in FCE revision is listening to and understanding different accents. He thinks candidates should familiarise themselves with as many dialects as possible, so they have less of a chance of hearing an unfamiliar accent in the actual exam. He is talking to a bunch of students, who all hail from different places, so they can talk naturally and see if Emma has good comprehension of what they are saying. GORDON: Ok Emma, my students should all be here by now. Ah, yes, they all are here now. Hey guys! GORDON: So, if nobody minds, what I thought we could do is have you all introduce yourselves. Then you can all say where you’re from and two interesting facts about your countries. Sound good? ERIN: Ok, so Hi! I’m Erin and I’m from Liverpool. Liverpool is in the North West of England and the 4th biggest city in England. One interesting thing about my city is the fact that the Anglican Cathedral is the 5th largest cathedral in the world, moreover; the bells of the cathedral tower are the heaviest in the world. Another fact is that it can easily claim to be the capital of pop music. More artists with a Liverpool origin have had a number one hit than from any other location. DAVE: Wow I didn’t know that. Hi everyone, I’m Dave. I’m from Australia but my parents are from Manchester. Something which stands out about Manchester is the fact that it was the world’s first industrial city when it became a city in 1853. Also, another thing which interests me is the fact that the world’s first passenger railway ran from Manchester. CHRISTIAN: That’s fascinating. I’m Christian by the way. I’m from California, USA. What can I say about my hometown? Well, did you guys know that it is referred to as the golden state mainly because of the discovery of gold in 1848 and the golden poppies which grow to brighten up fields across the state each summer. Also, California produces more than 17 million gallons of wine each year. ASHLYN: Wow! Hi guys, I’m Ashlyn. I’m from Mumbai in India. I think something interesting about my birthplace is the fact that the median age of residents here is 26 and almost half of the population is younger than 24 years old. How crazy is that? I don’t know if older people are migrating out from there or if more younger people are immigrating in. I want to live in Cape-town, South Africa. I also think it’s worth mentioning that the world’s first human heart transplant was performed in Cape Town, by Dr Christiaan Barnard in 1967. LILY: Hi, I’m Lily and I’m from Florida in the USA. Did you guys know that when Florida was first discovered by the Spanish. They called it Florida because of all the beautiful flowers they encountered. COLIN: You can say that again Lily. How’s it going everyone? I’m Colin and I hail from Wellington, New Zealand. What can I tell you about where I’m from? Well, people from New Zealand are given the nickname of “kiwis”. Why? Well, because the kiwi is a flightless bird which is our national emblem. Also, New Zealand is pretty renowned for rugby. In fact, we won the first rugby world cup in 1987. JESS: Sorry I’m late. Don’t forget to tell them about the size of our country! Hi, I’m Jess and I’m from New Zealand too, Auckland, to be specific. What I was going to say is that New Zealand is almost the same size as Japan, but its population is only around 4 million people, making it one of the world’s least populated country. Another fact which I’m particularly proud of is the fact New Zealand is the first country which gave women the right to vote. GORDON: Well, I think we’ve all learned a few fun facts about different places! Thanks for coming guys, I think the wide range of accents we have here has been perfect for Emma to try and get used to. A b2 first speaking Tip. The day of the exam there are 4 parts in the FCE Speaking test. This lesson’s exam tip will be about SPEAKING PART 3. This third part of the speaking exam, you must complete with your partner. You will be given some pictures, (a spider-gram with a topic and ideas to discuss), and you will have to discuss them, give your opinion, as well as make a decision about the pictures with your partner. (student B). You will also be expected to involve your partner, – so that you don’t just talk by yourself – you can do this by asking him or her questions, and encouraging him or her to ask you questions too. During this section you will have to discuss all of the pictures, then make a decision. In the case that your partner talks too much, just interject and ask if you can give your opinion. However if he or she doesn’t speak enough, then try to encourage him or her to speak. Let’s decide about…, shall we? What would happen if people didn’t do anything? What if there were no opportunity to change? (What) have we decided then? I think that’s it, don’t you?